A researcher from Finland spent a couple of days learning about the NASA-sponsored Classroom of the Future program during a visit to the Center for Educational Technologies as part of a mission that also took her to the Ohio State University. Dr. Karolina Kiil, a researcher in the School of Art and Design at Aalto University in Helsinki, visited the Center for Educational Technologies Nov. 14-15. One of her current areas of research is LEGO robotics as an area of art and technology instruction. With funding from the West Virginia Space Grant Consortium, the Classroom of the Future has helped grow the FIRST LEGO League program through the state. Dr. Meri Cummings of the Classroom of the Future is the director of the annual West Virginia robotics tournament. 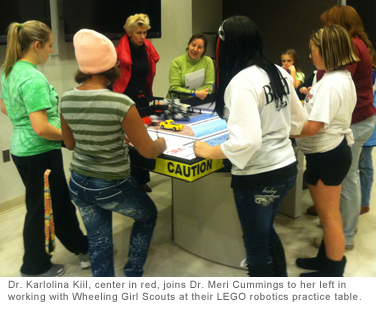 At a reception Kiil met with Wheeling-area Girl Scout troops who are participating in LEGO robotics competitions. She said it was great to meet people involved in the subjects she's researching. She added that she is also involved in studies about the relation of technology and girls. Kiil said her inspiration for the trip to Wheeling arose from an article titled "Classroom of the Future" published in a popular Finnish science magazine, which featured an interview with Dr. Laurie Ruberg, associate director of the Center for Educational Technologies. Kiil's visit was made possible through a long-time correspondence with Ruberg, based on this Finnish story about the Classroom of the Future program.